CHEVY CHASE, Md.--(BUSINESS WIRE)-- JBG SMITH (NYSE: JBGS), a leading owner and developer of high-quality, mixed-use properties in the Washington, DC market, is pleased to announce that Amazon has selected JBG SMITH as its partner to house and develop a new headquarters location at National Landing in Arlington, Virginia. JBG SMITH reached an agreement for exclusivity and negotiations that will give Amazon exclusive rights to lease space in several JBG SMITH buildings and to purchase land owned by JBG SMITH in Northern Virginia’s National Landing, where one of the new Amazon headquarters will be located. This decision represents the culmination of an exhaustive search on the part of Amazon and an extraordinary effort by the JBG SMITH team, Arlington County, the City of Alexandria and the Commonwealth of Virginia. National Landing is the newly defined interconnected and walkable neighborhood that encompasses Crystal City, the eastern portion of Pentagon City and the northern portion of Potomac Yard. It is situated across the Potomac River from Washington, DC and is one of the region’s best-located urban communities. 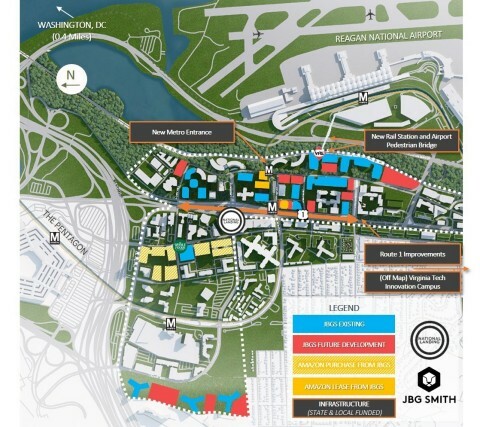 It is defined by its central and easily accessible location, its adjacency to Reagan National Airport, and its existing mixed-use environment, including offices, apartments and hotels. In National Landing, JBG SMITH owns 6.2 million square feet of existing office space, 2,850 units of existing multifamily space, and controls 7.4 million square feet of additional development opportunities, excluding Amazon’s proposed land purchase. Amazon’s commitment to National Landing is transformative for the Washington, DC region. In the coming years, Amazon is expected to bring more than 25,000 employees to National Landing at an average wage of over $150,000. Amazon HQ at National Landing will also serve as a catalyst to accelerate JBG SMITH’s long-term placemaking and repositioning of the entire National Landing neighborhood. Lease approximately 500,000 square feet of existing office space at 241 18th Street S., 1800 South Bell Street, and 1770 Crystal Drive. Purchase Pen Place and Met 6, 7, 8 land in JBG SMITH’s Future Development Pipeline with Estimated Potential Development Density of up to 4.1 million square feet. JBG SMITH has the right to time the expected closings of the land parcel sales to facilitate 1031 exchange opportunities. Engage JBG SMITH as its development partner, property manager, and retail leasing agent. Commence predevelopment and planning of the first office building in 2018, with construction expected to begin in 2019. Invest up to $295 million of non-general fund money in transportation projects that will improve mobility in the region, including additional entrances to the Metro stations at Crystal City and Potomac Yard, improvements to Route 1, a connector bridge from Crystal City to Washington National Airport, and a transitway expansion supporting Pentagon City, Crystal City, and Potomac Yard. Additional funding would be available if Amazon creates more than 25,000 jobs. Make performance-based investments of up to $375 million over 20 years for new master’s degree programs in computer science and related fields at George Mason’s Arlington campus and for Virginia Tech to establish a new Innovation Campus in Alexandria, both of which are subject to a one-to-one match from the universities with philanthropic funds. In addition to the Commonwealth’s investments, Arlington County and the City of Alexandria have announced that they plan to fund over $570 million for transportation projects, including rail connections, transit facilities, multi-modal streets, and corridor connectivity serving the site. Central District Retail (approximately 130,000 gross square feet of retail) expected to commence construction in the fourth quarter of 2018. 1770 Crystal Drive (approximately 272,000 net rentable square feet of office and retail with 100% of the office portion expected to be preleased to Amazon) expected to commence construction in the fourth quarter of 2018. 1900 Crystal Drive (approximately 750 units of multifamily in two buildings) expected to commence construction in 2019. In addition to the acceleration of the first tranche of new development opportunity, JBG SMITH controls an additional 6.2 million square feet of office and multifamily development opportunities, all of which are advancing through the planning, entitlement and design process for potential future development. For more information about National Landing please visit www.nationallanding.com. All arrangements between Amazon and JBG SMITH are subject to negotiation and execution of definitive documentation. Certain statements contained herein may constitute “forward-looking statements” as such term is defined in Section 27A of the Securities Act of 1933, as amended, and Section 21E of the Securities Exchange Act of 1934, as amended. Forward-looking statements are not guarantees of performance. They represent our intentions, plans, expectations and beliefs and are subject to numerous assumptions, risks and uncertainties. Consequently, the future results of JBG SMITH Properties (“JBG SMITH” or the “Company”) may differ materially from those expressed in these forward-looking statements. You can find many of these statements by looking for words such as “approximate”, “believes”, “expects”, “anticipates”, “estimates”, “intends”, “plans”, “would”, “may” or similar expressions in this press release. We also note the following forward-looking statements: in the case of our construction and near-term development assets, estimated square feet, estimated number of units and in the case of our future development assets, estimated potential development density; expected entry into definitive documents with Amazon regarding key Amazon transaction terms; planned infrastructure improvements; and the economic impacts of Amazon’s HQ at National Landing on the DC region, and National Landing. Many of the factors that will determine the outcome of these and our other forward-looking statements are beyond our ability to control or predict. These factors include, among others: adverse economic conditions in the Washington, DC metropolitan area, the timing of and costs associated with development and property improvements, financing commitments, and general competitive factors. For further discussion of factors that could materially affect the outcome of our forward-looking statements and other risks and uncertainties, see “Risk Factors” and the Cautionary Statement Concerning Forward-Looking Statements in the Company's Annual Report on Form 10-K for the year ended December 31, 2017 and other periodic reports the Company files with the Securities and Exchange Commission. For these statements, we claim the protection of the safe harbor for forward-looking statements contained in the Private Securities Litigation Reform Act of 1995. You are cautioned not to place undue reliance on our forward-looking statements. All subsequent written and oral forward-looking statements attributable to us or any person acting on our behalf are expressly qualified in their entirety by the cautionary statements contained or referred to in this section. We do not undertake any obligation to release publicly any revisions to our forward-looking statements after the date hereof.